A Florida pastor's plan to burn Qurans at his church on Sept. 11 ignited protests for a second day by hundreds of Afghans, who burned U.S. flags and shouted "Death to America," prompting the top U.S. commander in Afghanistan to say that the pastor could be increasing the threat to his troops. 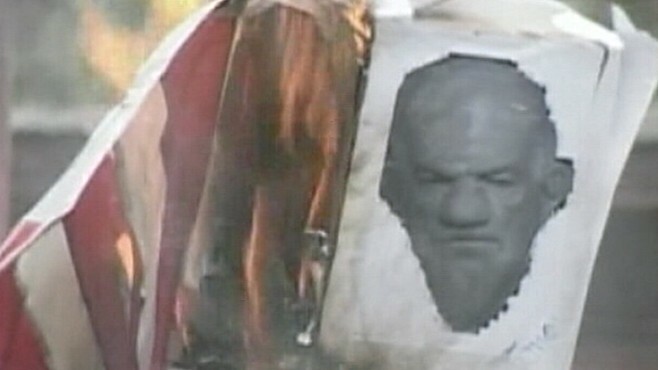 The crowd in downtown Kabul reached nearly 500 Monday, with Afghan protesters chanting "Long live Islam" and "Long live the Quran," and burning an effigy of Terry Jones, senior pastor of the Dove World Outreach Center in Gainesville, who is planning the event. The protesters were well aware of the pastor's inflammatory comments, such as "Islam is an evil religion," because they have spread via the Internet. Jones has also authored a book, "Islam Is of the Devil." "America cannot eliminate Muslims from the world," one Afghan man told ABC News. The angry crowd pelted a passing U.S. military convoy with rocks. Gen. David Petraeus said he is outraged by the pastor's decision to burn the Quran, which, he said, could "endanger troops and it could endanger the overall effort here." "It puts our soldiers in jeopardy very likely," he told ABC News Tuesday. "And I think, in fact, images from such activity could very well be used by extremists here and around the world." Former Vice Chief of Staff of the Army Gen. Jack Keane, an adviser to Petraeus, called it "outrageous" and "insulting to Muslims." "It's also insulting to our soldiers in terms of what they stand for and what their commitment is to this country and to the Muslims in this country," Keane told ABC News. But Jones vowed he would go ahead with the Quran burning, even knowing the concerns of Petraeus and Keane for the safety of U.S. troops. "Of course we care. It'd be tragical if because of this one person died. But at the same time, we do not feel responsible for that," Jones said in an interview with ABC News. "What we are doing is long overdue," he said. "We are revealing the violence of Islam that is much, much deeper than we'd like to admit." One Facebook page dedicated to the day, titled "International Burn A Koran Day" has more than 8,000 fans. "On September 11th, 2010, from 6pm - 9pm, we will burn the Koran on the property of Dove World Outreach Center in Gainesville, FL in remembrance of the fallen victims of 9/11 and to stand against the evil of Islam. Islam is of the devil!" the page declares. Over a hundred other pages have sprung up for and against the event on Sept. 11, incidentally the same day as a Muslim holiday called Eid, celebrating the last day of Ramadan, the Islamic holy month of fasting. Some Muslims fear that images of celebration could fuel further tensions with Americans that day. ABC News' Kristina Wong contributed to this report from Washington.